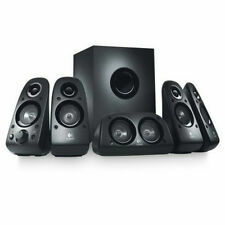 Sony Home Theater Surround Sound (3) Speakers System SS-TS71, SS-TS73. Condition is Used. Shipped with USPS Priority Mail. This is a pair of Yamaha speaker. The grills are not cracked or ripped. The cabinet have a few rub marks, but no deep scratches, even on the bottoms. · Work with you in a fair and equitable way if there are any issues. Yamaha Surround Sound Speakers(Two) Model NS-AP2600S (BL). Condition is Used. Shipped with USPS Retail Ground. This is a pair of Mirage AVS-200 speakers. The grills are not cracked or ripped, but one of the logo badges is missing. Also, one speaker has screw holes on the bottom. · Work with you in a fair and equitable way if there are any issues. JBL 4 PIECE CS6100 SURROUND SOUND SPEAKERS. Condition is Used. Shipped with USPS Retail Ground. These are NEW never used without the box but still in Styrofoam. 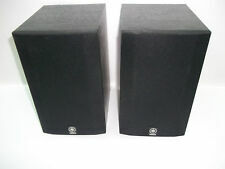 Two Sony SS-RS301 & One SS-CT301 Center Surround Sound Speakers. In very good condition. Tested and works great. There is minor wear on two of the corners. Acquired in an estate sale. Being sold as is. Technics SB-S926 surround sound speakers. These speakers are in excellent used condition both functionally and cosmetically. 35 watt RMS power rating and 8 ohm impedence. These speakers are being sold as-is and no warranty is expressed or implied. Insured shipping via USPS Priority Mail. The speakers are in nice shape and sound great. They have minor surface marks from use. Please view images for most accurate representation of physical condition. The items pictured are the items that the buyer will receive. Includes (4) SS-TS102 front/rear left/right satellite speakers and (1) SS-CT101 center channel speaker. (2) Surround Sound Speakers. (2) Mounting Brackets for wall mounting with screws. 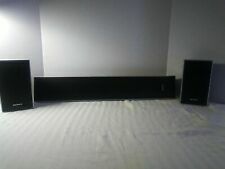 Here is a set of 3 BOSE Double Cube Surround Sound Speakers. They have signs of use/wear. Video of Rockslim Black Item Code: ROCKSLIM BLACK THEATRE. Beautiful sleek design is perfect for a living room, bedroom, kitchen, restaurant, and more. Molded speaker wire groove makes it easy to run speaker wires behind the speaker. Booming Subwoofer. 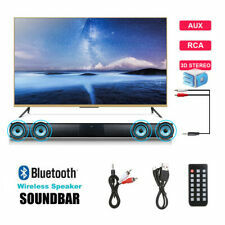 Rich 3D stereo in 5.1 surround sound, even from 2-channel stereo sources. DVD player. Color-coded speaker cables. 3.5 mm and six channel direct audio cables. 75 watts (RMS) of balanced power and room-filling sound. Sony SS-SR301 Pyramid Surround Sound Speakers. Condition is Used. Used very little. Smoke free home. Surround Sound Speakers! with 2 speakers attached to each other, they rotate 180. I only have one bracket, which works great w/picture hangar for wall hanging. Onkyo 5.1 Channel Surround Sound Speaker System. - 1 Powered Subwoofer (SKW-520). - 3 Surround Speakers (SKM-520S). Proceeds are used to support local programs and services. a third rear speaker. The set was missing a Front speaker so it was replaced with. This is a pair of Yamaha speakers. They are in very good working condition. The cabinets have scratches and marks, especially on the bottoms. I took photos of all 6 sides. The speakers have sequential serial numbers. Surround Sound Speakers System. Very Good used working condition. Samsung 5 Speaker PS-FS1-1 Home Theater Surround Sound ~SPEAKERS ONLY~. These have never been used, just open the wrapping to show the speaker and brand. Surround-Right Surround-Left Surround- Center Front left Front right Thanks for viewing this item and feel free to message with any questions.My Items are stain free, no tears or flaws unless stated otherwise in the description. Please look at the photos above to help judge the condition of the item for yourself. Item comes from a smoke free and pet free home. All sales final. Thanks and happy bidding! 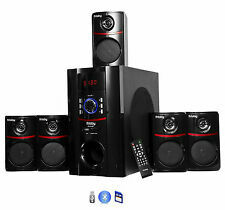 Philips Surround Sound Home Theater System Speakers, SW & CS-3544 E. With Free DVD player. Minus remote for DVD player. Well-maintained Onkyo SKF-530F standing surround sound speakers, including both front right and front left channels. SAMSUNG SURROUND SOUND SPEAKERS AND SUBWOOFER. IN GOOD CONDITION - SEE PICTURES.